NuLEDs PoE intelligent lighting controls connect LED lighting installations to the Internet. We provide an essential link between LED light fixtures and the Internet of Things (IoT). With NuLEDs technology, lighting can be powered over Ethernet, using low-voltage CAT5 cable. The LED light fixtures get an IP address, interact with networked sensors, devices, and mobile users, and are fully programmable. 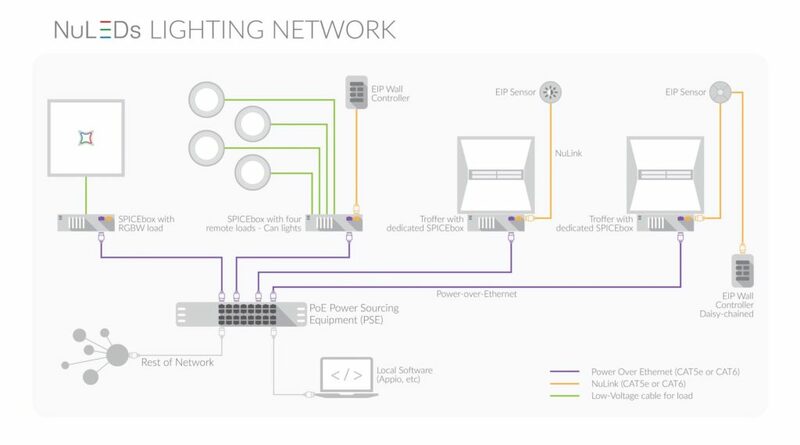 NuSPICE™ protocol controls LED brightness through four channels, enabling ultra-smooth dimming, color-mixing, and color-tuning. A Networking Device connected directly to the PoE switch with a CAT5 cable. The intelligent interface between the network and the LED loads. Software providing a simple web-based interface for commissioning, controlling and monitoring devices using NuSPICE.